Several month ago I was listening to a great podcast with Pam Barnhill interviewing Jennifer Mackintosh about her Mother’s Morning Basket. While I already had some materials I used for my morning quiet time, the idea of a basket with a variety of materials really appealed to me. So I put together a Morning Quiet Time Basket of my own. Hopefully seeing what is included in mine may inspire you to put a basket of your own together. My morning time using materials out of my basket has become my favorite time of day. Here is what I have in my basket. My first Bible as a young Christian was the New King James Version of the MacArthur Study Bible. It is still my Bible of choice and holds a very special place in my heart. It is the Bible I read and study daily. My monthly devotional book while I study the book of Philippians is Experiencing God’s Peace. This is the first of Elizabeth George’s studies I have worked through and I plan to add several more to my reading next year. They are very thorough and dip deep into the meaning of Scripture. My Bible copywork notebook is just a plain composition notebook where I copy down sections of the Bible I am currently studying. My index card books: one I use for a prayer journal and one I use for truth cards that go along with my study of Taste for Truth. My Taste for Truth Bible Study book that I use for days when I am struggling with food. I have gone through this Bible study and finished it, but I keep it in there for the times I need a little extra encouragement. Years of dieting has been very destructive on my relationship with food, but this Bible study has helped tremendously. My latest book review for the blog, 31 Proverbs to Light Your Path, also by Liz Curtis Higgs (I love her writing style- it’s like sitting back and listening to a friend tell you a story). My current library book to read, which is The Life Giving Home. I absolutely love this book, and have decided to actually buy it so I can work through it this upcoming year, month by month. I also purchased The Lifegiving Home Experience. My favorite Christmas book, The Women of Christmas. This book always puts me in right frame of mind as the rest of the world experiences Christmas craziness. Last year at Christmas we read Glenn Beck’s Immortal Nicholas, which was fantastic! So this year I am reading through The Christmas Sweater. Glenn Beck never disappoints as a story-teller. My Christmas devotional, The Greatest Gift. No one can dive into deeply spiritual matters like Ann Voskamp. I highly recommend this book if you need a Christmas devotional. My reading journal, which contains my commonplace journal (my favorite quotes from books I have read) and also has my list of books I have read this year. My Book Darts. I can’t live without them. I use this with every book I read so that I can easily come back and copy my favorite quotes in my reading journal. And that is about all my morning quiet time basket can hold. I love that each morning can be a little bit different depending on what I choose to read or write. The time I spend using materials out of my basket can be anywhere from 15 minutes to about an hour. There are even some evenings when I take my basket out to do some reading. It’s just so flexible and enjoyable. After the Christmas season, I will rotate in some more educational categories for reading such as history and science. I’m also planning on working my way through The Young Wives’ Guide 2018 Christian Reading Challenge. She has some great book suggestions that will definitely find their way into my basket. It’s amazing to me how much reading I was able to accomplish this year just by making my basket of books a priority. I highly encourage you all to pull together your favorite materials and create a basket of your very own. And I’d love to hear what you put in it if put together your own morning quiet time basket. One of my goals in my spiritual life is to take Scripture and make it alive by living out what I read. The book of Proverbs has always been my favorite book for advice and teaching, so when I saw one of my favorite authors, Liz Curtis Higgs was writing a book about Proverbs, I just knew it would be a good option to add to my reading list. Each of the 31 chapters in 31 Proverbs to Light Your Path covers a different lesson in a passage taken from Proverbs. The Proverb is listed at the beginning and is followed by a lesson from Liz on how to apply the teaching from the Proverb, and also what she has learned from it in her life. Each chapter closes with a prayer and a section called “One Minute, One Step”. This section is my favorite and gives the reader a way to apply what they have learned that chapter. None of the activities are long or difficult, but they really bring home the meaning behind the teaching in Proverbs. Liz is one of my favorite authors because of her authentic and conversational writing style. She shares some raw and personal stories that really made me feel as if she had a heart-felt desire to teach, inspire, and encourage me as the reader. By sharing her stories she makes it known that she isn’t speaking from a pulpit of perfection, but also struggles with sin on a daily basis just like the rest of us. This book made a perfect addition to my morning quiet time. The chapters are short and sweet, but are packed with so much goodness. You can take a whole month to go through the 31 chapters of this book and savor it’s lessons. Reading one chapter per day will allow you plenty of time to do the “One Minute, One Step” section. The book also includes a study guide in the back to dig even deeper into Scripture. I would highly recommend this book to any busy woman who needs a concise book that digs deep into the Word of God and gives practical ways to live it out. I’ll leave you with some of my favorite quotes from the book that made their way into my own commonplace notebook. It’s so good to be back to blogging! Since I decided to abruptly jump back into the blogging world, I figured I could at least update you all on how we are and how we’ve grown! We just finished birthday season at our house, and all of these crazy kids are now a year older. Our oldest is now 14 (8th grade), our daughter is 12 (6th grade), our middle boy is 9 (3rd grade), and our little baby is now 7 (1st grade). Sigh. Whoever said the little years would fly by was completely correct. Before I know it we’ll be teaching driving and visiting colleges. 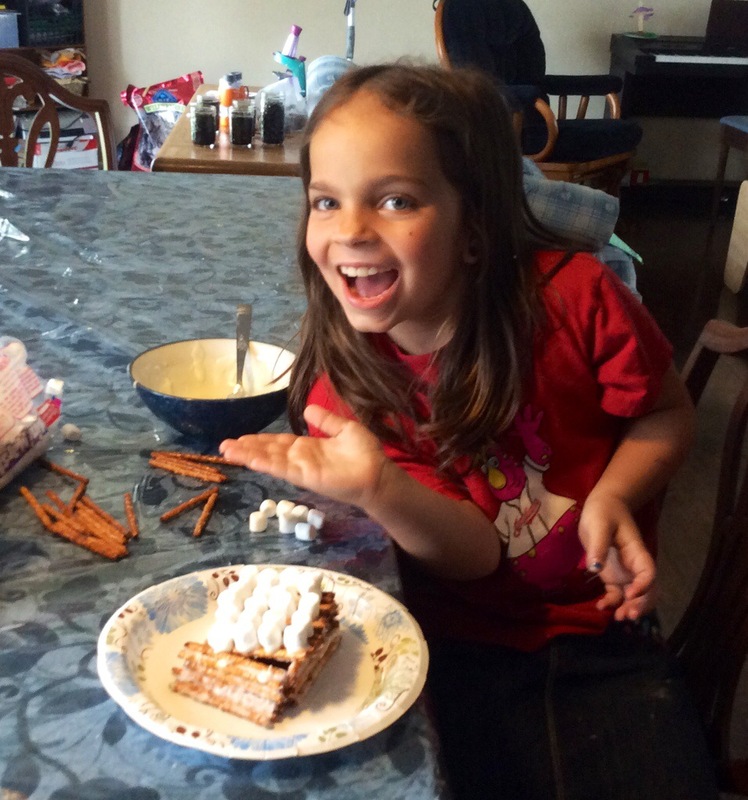 We are still homeschooling and having a great year! I can’t wait to share with you more about what we are doing and how I am dealing with schooling all four children. 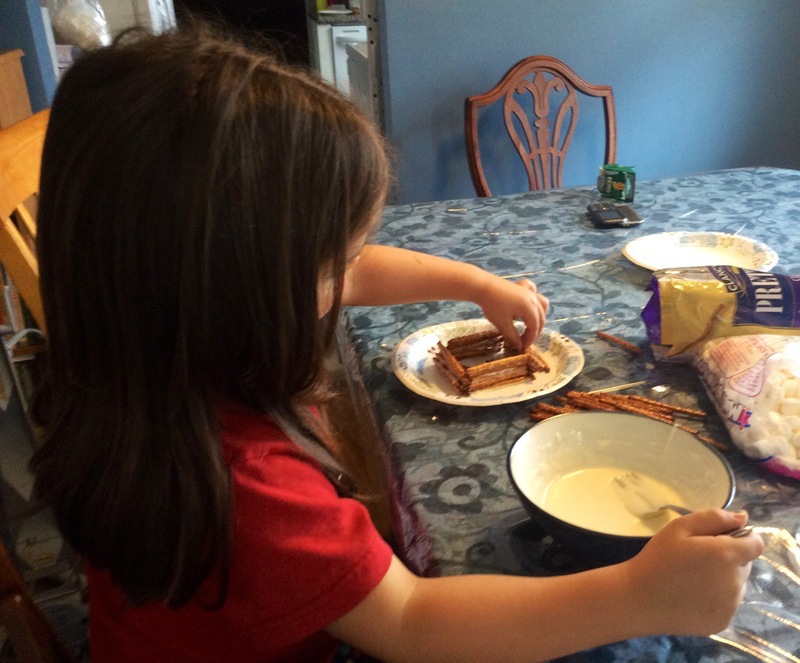 I’m so thankful that we seem to have found our sweet spot with homeschooling. Not only have the kids grown, but so had the number of furry children we have in our house. We still have our sweet lab mix who is such a wonderfully low maintenance dog. She loves cuddling up with anyone who will allow it and she is such a great helper with our other dog. My husband has always dreamed of being a K-9 officer. Several years ago, we thought that dream was about to come true…until it didn’t. He passed all of the tests but lost out to another officer who had more seniority in the department than him. So his consolation prize was a German Shepherd puppy we brought home at 5 pounds (and is now close to 90 pounds!). This dog is so full of life and could calm anyone’s fear of German Shepherds (including my own!). He is truly a gentle giant and I believe he was sent to our family to prepare us for the next adventure in our life. He can often be found either playing with our other dog or sneaking away with my slippers (I may or may not have gone through 6 pair of slippers in the past two years). When our Shepherd was about 2 years old, a K-9 spot opened up at the department again. We weren’t expecting it, but knew my husband had to try for it again. Well, this time he got it! So we now have 3 dogs and 4 kids in our 3 bedroom house. This K-9 is the absolute sweetest dog you could ever meet…except she hates our other dogs. So our days involve a lot of shuffling around of dogs when she isn’t at work. But she gives me such peace of mind knowing that she would do anything in the world to protect my husband at work. I will gladly deal with the minor inconveniences for that! So here I am, back to blogging again! I’m so excited to once again begin sharing all of the craziness of our lives. I looked back one day at all of the pictures from my previous blogging and felt an ache in my heart that I didn’t have those wonderful documented memories from the past few years. I haven’t quite decided specifically all I am going to do with blogging, but if all I end up with are posts of watching my family grow, then it will be well worth it! Thanks for joining me once again on the journey! I know it’s been a while, but I have something so exciting to share with you today. 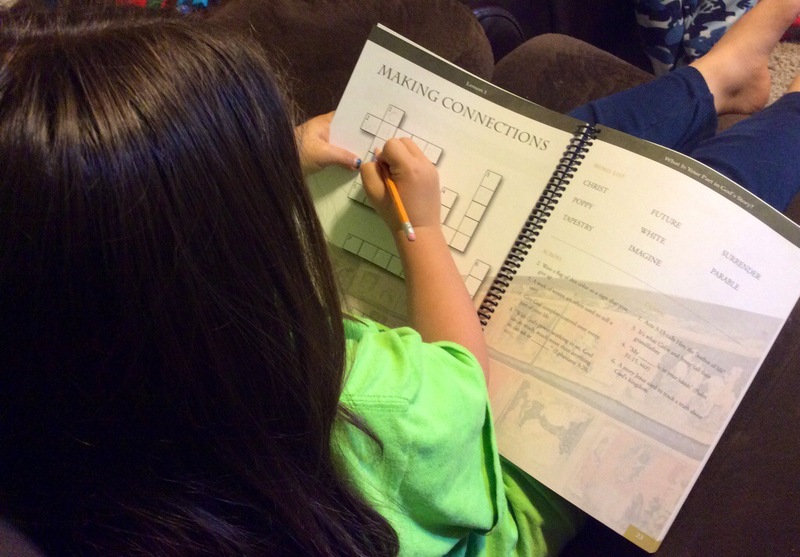 I just had to hop back on here and tell you all the exciting new curriculum we found this year and how it has blessed our homeschool beyond belief. You all know I am a bit of a planner and spent so much time planning out our homeschool year in the hopes that I can put together the best year ever (each and every year). Well, that is exactly what happened at the end of last winter (the best time of year to plan the next school year…what else is there to do that time of year?). I spent weeks planning and scheduling every part of our school day and year, right down to every chapter and page number in every book we would read. I truly didn’t expect it all to fall apart two weeks into the year. You see, I underestimated how much both the kids and I preferred to do most of their subjects together (minus language arts and math, or course). So there I was with a great plan for an individualized education for each of my children, and nothing to do with it. Enter The Good and the Beautiful. Through some online research, I found this new Christ-centered curriculum that was surprisingly affordable and looked quite rigorous and fun as well…how is that even possible?! At the time, the Creative Writing Notebook was a free download, so I downloaded it to check it out. It looked so amazing that I decided to buy the Nature Notebook. Both the Nature Notebook and the Creative Writing Notebook proved to me that this curriculum was the real deal. Someone was putting a whole lot of time and effort into creating materials that seemed to be sent from God to our family. As I continued to research and explore the website there really wasn’t a single subject that didn’t catch my eye. The Language Arts programs for levels 1-5 are completely free, so I immediately downloaded a level to check it out. Wow…just wow! The lessons were impressive and included so many different aspects of language arts (and beyond! ), and I didn’t have to do any of the planning. So I purchased each level that each of my children would need (all I had to buy were readers and flashcards that went with the various levels). My two older children are doing a level below their grade level since this is new to them and I didn’t want to set them up to be overwhelmed. My two younger boys are both working in the same level as their grade. Here is what is used in each level we have for this year. The free download includes pdfs of the course book, the course companion, flashcards, the mini books in level 1, and the shared reader in level 5 (which I am thoroughly enjoying reading with my daughter). I purchased the additional materials (and level 7), but they are still considerably cheaper than any other homeschool materials I have seen. All of the levels include instruction in reading, spelling, grammar and punctuation, literature, art appreciation, and writing. The younger levels include phonics instruction and the older levels include vocabulary and geography instruction. Not every part is done every day, and each lesson is just different enough to keep us on our toes. I am so impressed by the rigor of the teaching and most days I find myself learning just as much as my kids do! Most years I dread standardized testing at the end of the year because I have a few children that struggle with spelling, but since we started with The Good and the Beautiful in July, I have seen so much improvement that I can’t wait for them to take their tests to see how much they have improved! That took care of a need in our homeschool that I didn’t even know we had. But there were still the subjects to do together…mainly history and science. As far as history goes, I feel like through our decade of homeschooling we have tried just about everything approach out there. We’ve done history cycles, multiple history strands simultaneously, and just focused on American history. None of them felt complete or kept our attention for long (the history cycle always seemed to fizzle after Ancient History and send us back to focusing just on American History). But the Good and the Beautiful approaches history in such a unique way, and we are loving it! They do a sweeping view of world history from the beginning to the present each year focusing on different parts every time through. With Year 1, we have 4 units: Ancient History, the Middle Ages & the Renaissance, The French and Indian War through the Revolutionary War, and the Victorian Era, the History of Flight & The Cold War Era. We are about half way through Year 1, and are enjoying it just as much now as we did when we first received the new books! The history course includes a course book, The Big Book of History Stories (a beautiful book filled with wonderful stories that tie in with the history lessons), Dramatized Audio Recordings (these are like listening to an amazing audio book), Student Explorer guides (so that each child can experience the history lesson in an age-appropriate way), and the Keys of History Board Game. This game is amazing. When I saw a game was included with the curriculum I thought it would be fun, but I never expected it to be the quality that it is. We played this game the first day we received our curriculum, and we haven’t stopped since! In fact, if you have a history buff in your life, I could see this game making a wonderful Christmas present. Much like the language arts programs, each day of history is a little bit different. While there are a few projects included, they are not every day (which makes me very happy!). There is a list of suggested read alouds to help tie history together, and we have really enjoyed all of the books we have read so far. This is by far our best year in studying history, and just like I said before, I am learning just as much about history as the kids are! So now that leaves science, the subject that has never been my strongest. But my kids love science! When we ordered our history from the Good and the Beautiful, I decided to try out a couple of the science units (Meteorology and Water and Our World). Just like the other subjects, these have some serious depth. There are even added research topics for my older children to do. After completing the Meteorology unit, I now have four new weather forecasters in our home. We had so much fun completing the experiments and daily weather sheets! The materials are open-and-go with lists of supplies for each lesson at the beginning of the unit (most are simple household items) and also read aloud suggestions (which were easy to find in our library…no obscure and impossible to find books!). Now that we have been through one unit and are starting our next, I truly appreciate all of the prep work that has been done for me. I can collect materials before we begin each unit and have nothing to do each day but present the lesson. We have loved science so much that just yesterday I ordered two more units to complete after Christmas break. I can honestly say that this curriculum coming into our homeschool has been a game changer. I no longer spend countless hours planning and adjusting our days…we just open our books and do the next lesson. The last few years I feel like I have been treading water in our homeschool, but this year we have taken off and are having what I consider our best year ever! Everyone is happy…including me. One of the most important aspects of choosing the Good and the Beautiful is that it opens up time in my schedule to take care of me, and in turn making me a stronger wife and mother. With the extra time I now have in my day my morning Bible time is longer, exercise is now a regular part of my morning routine, and my evenings can be spent un-distracted with my husband. I no longer have to spend time researching what other homeschooling method may work or searching for different books that my kids may enjoy more. We are content. While the Good and the Beautiful may not be for everyone, I encourage you to check it out if you are struggling in any area. They also offer handwriting and typing in addition to the subjects I mentioned above. We have truly enjoyed the fresh airthe Good and the Beautiful has brought into our school with their Christ-centered, affordable, and rigorous curriculum, and I think you will too! You all know by know that our family loves and is having great success with English Lessons through Literature. But, when it came time for us to do our yearly standardized testing, I quickly discovered the kids needed some help with spelling. The plain dictation wasn’t working as well as I hoped it would. They needed something to help them analyze words and learn the spelling rules in the process. 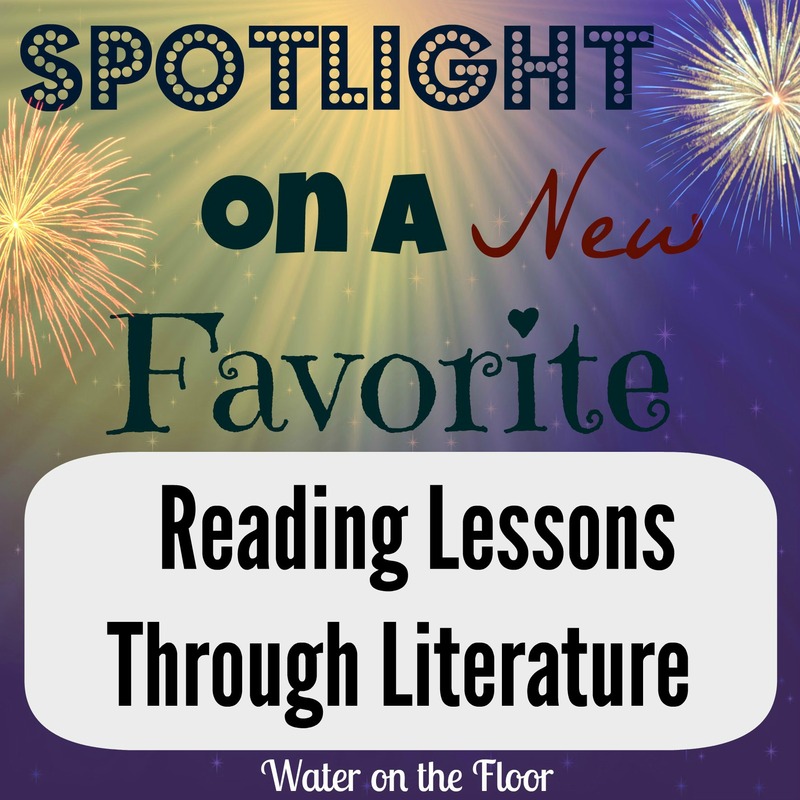 Enter a new favorite: Reading Lessons Through Literature . Not only is this program an amazing tool for teaching reading, it is also working for us as a spelling program. My older children are starting in level 2 since they already know the phonograms, and they are working through the spelling lists at an accelerated pace. I love this program so much that I have decided to use it for reading instruction with Moose. Since he is not comfortable writing yet, we are modifying the program a bit and I thought I would share with you how that looks. The first section of Reading Lessons through Literature is all about learning the phonograms. Your child works through the first 30 phonograms, learning a few new ones each day and reviewing the previous ones as you go. 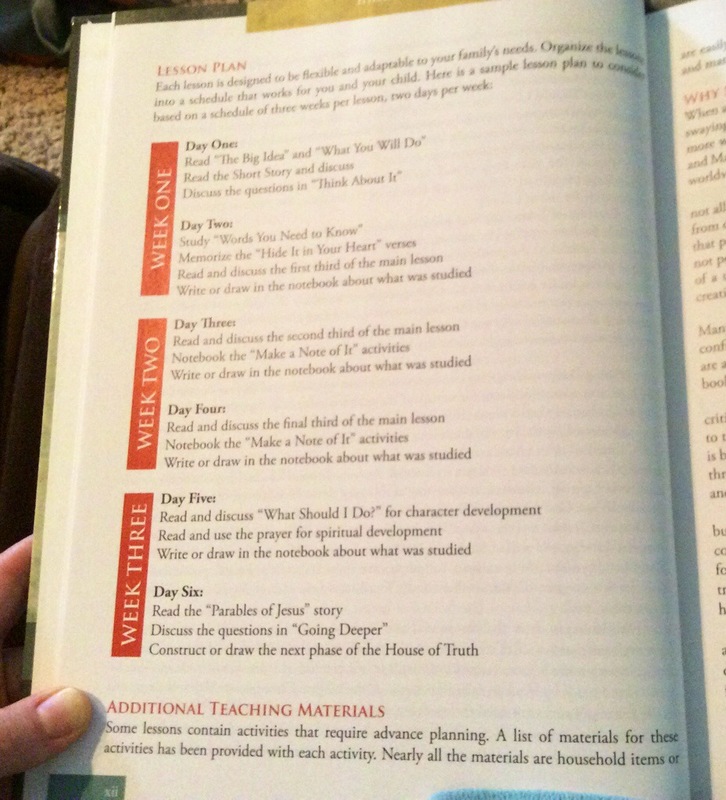 There is an easy reference chart in the back of the book to guide you in what to do each day for the lesson. We are following the chart for younger students with Moose, but there is also a chart for older students that are working at an accelerated pace. 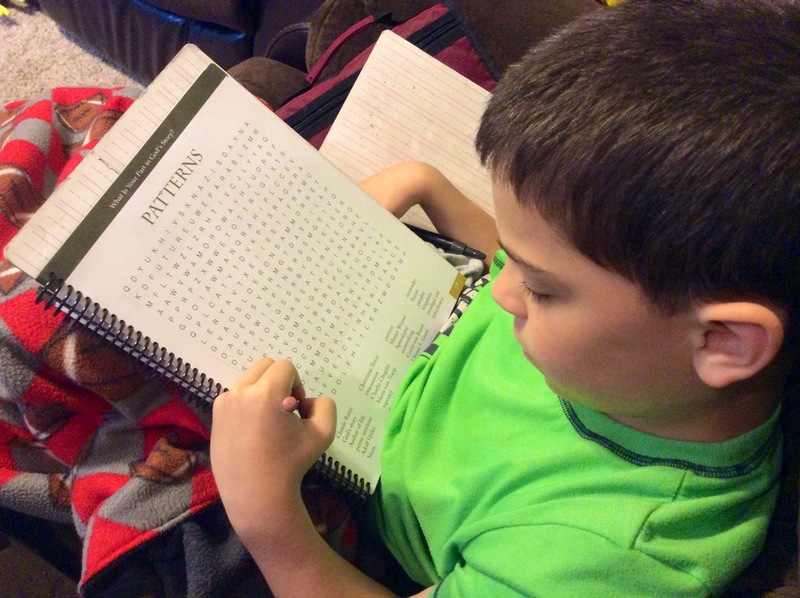 Moose finds the correct phonograms to make the words, and I write them in his spelling journal. After the first 30 phonograms are learned, you move on to the spelling journal, but still continue to add new and review old phonograms. With the younger students, five new words are learned three times per week. For each word, the phonograms are called out and the student writes the correct phonograms in their spelling journal. In Moose’s case, he spells out his words using the free phonogram tiles provided by the author. Then I write the word in his spelling journal for him. Moose- practicing his spelling words. After several spelling lists are completed, your child will be ready to read the corresponding story from the Elson readers in the back section of the book. Every word in the reading has already been studied and practiced using the spelling journal, so your child isn’t surprised by any new words. The first story has 20 spelling lists to complete before it is read. But after that, there is only one list of spelling words until another story is introduced. If there are any other new words in a story (such as a new name) there is note of it before the story begins and the analysis of the word is shown to the child. Other than finding your own spelling journal to write the words in, there are no other materials needed to do this program. There is an optional phonogram workbook if you feel your child needs some extra practice, but it isn’t necessary to use. For our spelling journal, I printed off some pages with our Notebooking Pages subscription and had them bound at our local UPS store. Our spelling notebook, along with the instructions for the spelling list. Why do we love Reading Lessons through Literature? *There is no extra fluff. The kids like games, but they also like to get their school work done. This is basic reading and spelling instruction at its best! *You can teach reading and spelling at the same time. I can already see this helping not only my older children, but also Moose, with spelling. It is amazing what learning phonograms can do for these two areas of language arts. *Lessons can easily be slowed down or accelerated. Every child learns at a different pace, and this program is so easy to customize it to fit your child’s needs. *The lessons are open-and-go. There is no preparation or set-up needed before you start a lesson. The only thing I had to prepare was the phonogram tiles. But that was a one-time thing. Now we just get out our book, phonogram cards, phonogram tiles, and spelling journal. We open the book and we are ready to go! *The program is very affordable and can be used with multiple children. Whether you purchase the actual book or the eBook, all of the materials can be used again. Any consumables are downloads and can be printed off for your whole family. Do you use anything for literature analysis is your home? I have always been leery of doing too much with literature since I didn’t want my kids to resist reading because of it. When I was growing up, I never enjoyed book reports, and literature analysis always felt to me like a book report. 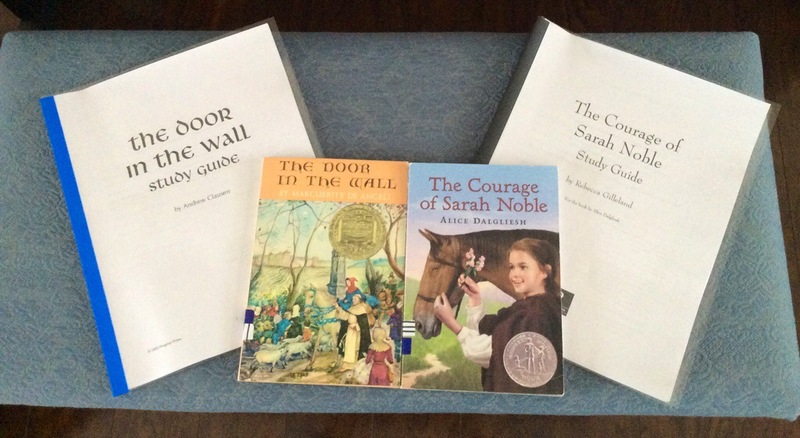 But when I was offered a chance to review the literature guides for The Door in the Wall and The Courage of Sarah Noble from Progeny Press, I thought it would be a great idea to give them a try since I have heard great things about them! The Door in the Wall e-guide retails for $16.99 and is intended for grades 3-5. The Courage of Sarah Noble e-guide retails for $11.99 and is intended for grades K-3. The Progeny Press guides come in four different levels: lower elementary, upper elementary, middle school, and high school. The guides can be purchased as a study guide on a CD or as an e-guide that is available as an instant download. Both can be printed time and time again for your children. You can also purchase the printed workbook. The great thing about the e-guides is they can be used interactively. So if your child prefers typing to writing, they can fill out the questions that way instead. The guides are intended to take about 8-12 weeks to complete and answer keys are available in the back of every guide. I decided to print off the guides for each of my children. Our computer is not always reliable and can run slow, so I figured this would be the best way to make sure the guides get done. We already own the books for the guides we are using, but most of the study guides are for award winning books that can be found in most public libraries. For my oldest son, I chose the guide for The Door in the Wall. This guide is intended for the upper elementary level. I love how the guides break the readings and activities into easily managed chunks. For Caspian, it worked out best to do a few days of reading, and then work on the study guide for the next few days. 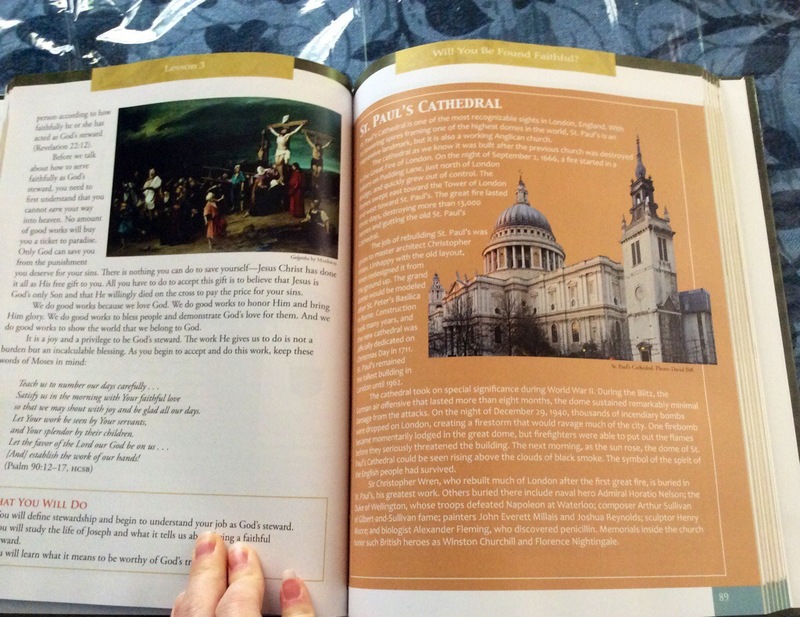 His guide came with great information about the book to help him understand the background. There were a few pre-reading activities, and then we jumped right into the guide. Each section is full of meaningful questions that can’t be answered with a simple “yes” or “no”. Some of the questions are directly about the story, but others really made him think beyond the story line of the book. There are wonderful exercises to broaden his vocabulary. One of my favorite parts of the guide is the Scripture references. I love how they use the story to connect to God’s word. There was obviously a lot of thought that was put into each and every question. We have had some wonderful discussions not only about the book, but also about how the answers can be applied to our lives. I just love the “dig deeper” section of the questions! I also love that the guide ends with wonderful suggestions of similar books and even some videos. If you have sparked an interest in a subject with these guides, you have an easy resource to guide you to more great things. 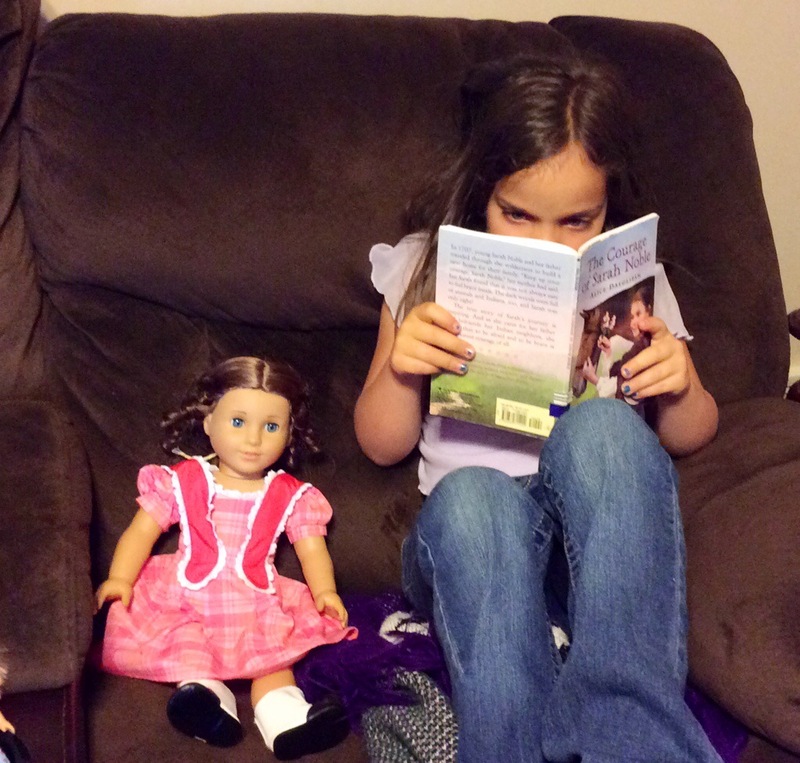 My daughter, Aurora, was given the guide for The Courage of Sarah Noble to use. This guide is for the lower elementary group. Even though Aurora already read this book last year, she was very excited and eager to read it again! Her guide included many things similar to Caspian’s, but just at a different level. She had vocabulary work along with some great questions, which again, included ties to Scripture. Then end of her book included some fun extras. There is a section of recipes, crafts, art, games, and even a crossword puzzle. The end of her guide also included other books by the author, and books related to the same time period as The Courage of Sarah Noble. These guides were a great first start for my kids in literature analysis. There is just enough work to help them learn, but not enough to overwhelm them. The authors of the guides suggest doing about one page per day, and for us that was a reasonable pace. I didn’t want to overwhelm them with too many questions, and this was perfect. I would think doing one or two of these guides per year would be a perfect balance of free reading and literature analysis. I know my kids would get quickly overwhelmed if we did one of these guides for every book, but a couple per year would be great. Click the link below to see what my other Crew members thought of Progeny Press. Do you teach a Biblical worldview along with your regular Bible studies? If this is something you would like to add to your studies, Apologia Educational Ministries has just what you need! They have just released the fourth book in their “What We Believe” series of worldview training. For this review I received the What on Earth Can I Do? 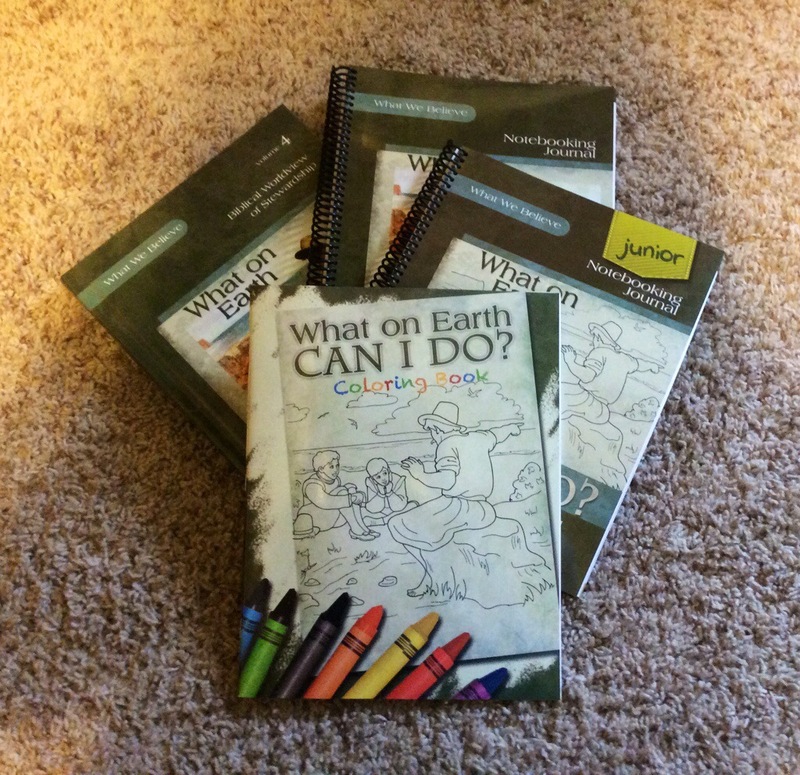 (hardback book), the What On Earth Can I Do Notebooking Journal, the What on Earth Can I Do, Junior Notebooking Journal, and the What on Earth Can I Do? Coloring Book. The hardback book retails for $39 and can be used with children in grades 1-6. Both the Notebooking Journal and the Junior Notebooking Journal retail for $24. The coloring book is perfect for your younger children to keep their hands busy while they listen, and it retails for $8. 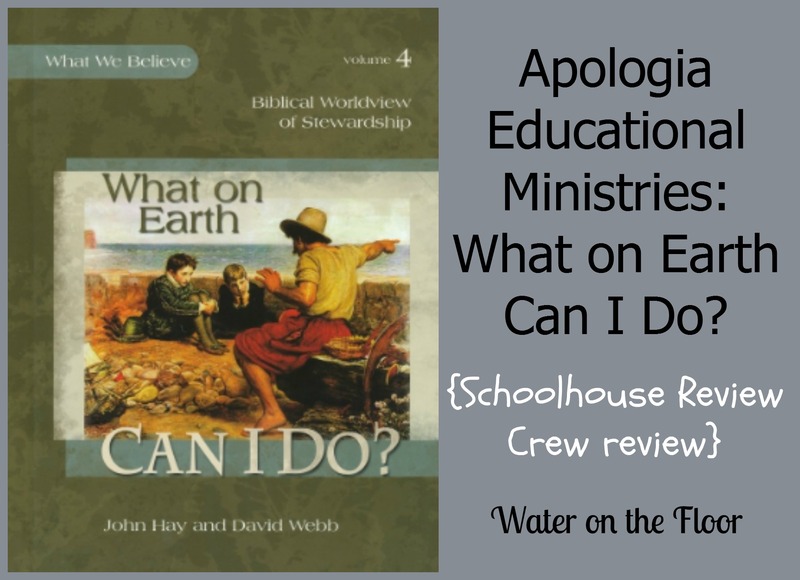 Although this is the fourth book in the What We Believe series from Apologia, this is our first experience with them. I have heard of them many times before, but have never really looked into it. That was a mistake, because these books are wonderful! They are all meant to show your children how the words and actions of God are woven into our lives and into history. The main book includes 8 lessons, but these lessons can take weeks to get through. The suggest time for each lesson is about two weeks, but we have found working at our own pace instead of working within that time frame, has worked very well. The stories in the book are easy to read and easy for the kids to follow. There are wonderful pictures to go along with the stories too. There are some fantastic journals to go along with the main book for your children to use. Caspian used the notebooking journal, Aurora used the junior notebooking journal, and the coloring book was for Moose. 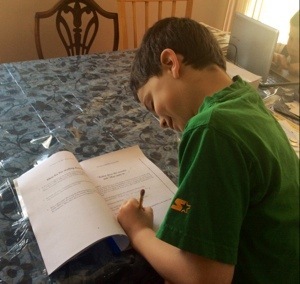 I love how these notebooks can bring the whole family together as they work to study the same topics. The notebooking journal is filled with comprehension and analysis questions, as well as crossword puzzles, word finds, and other pages to copy Scripture and take notes. The journal notebooking journal includes crosswords, coloring pages extra activities and book suggestions, and includes places to write prayers, copy Scriptures, and record praises.Both journals come with lesson plans at the beginning to instruct you on which activity to do in connection with your reading in the main book. The coloring book has several beautiful pictures to color for each lesson. The main book does give you a suggested lesson plan, but I found it was best to read a chunk each day and not force our way through anything. There are so many great stories in this book and I didn’t want my kids to miss any of it! I will admit, when these books first arrived, I wondered how well my children would listen to the stories. But I completely underestimated both my children and the authors. These stories are written in such a conversational way that it is easy for them to follow along. They have taken so much from the stories we have already read, and we aren’t even half way through the book yet! The greatest sign of curriculum success for me is when my children bring up something they have learned when we aren’t even doing school work. This has happened several times with the What on Earth Can I Do book. I really feel like teaching a Biblical worldview is so important for our children. Sometimes the Bible can seem so separated from our daily lives and our families are constantly bombarded with unbiblical things. It is so beneficial for children to hear and see that the works of God are woven into each moment of today and in history. From a Bunker hole in World War I to the Biblical days of Joseph and Potiphar, God has always been there, and he always will be there! I love the view of God’s sovereign hand this book has brought into our home. The kids are seeing how important their relationship with God is, even outside of our home. Seeing how wonderful these books are makes me ready to try the others in the series. It has sparked some great discussions and has proven to teach some very powerful stories in a way that I could never have done on my own. If you have used the other books in this series, I am sure you will love this one just as much. And if you have never used the Apologia What We Believe series, it is one that I would highly recommend. I am truly grateful for the blessing these books have been to our family! Click the link below to see what the other Crew members thought about What on Earth Can I Do?